IAM District 54 members at Libbey Glass in Toledo, OH were on strike for two weeks before accepting a new, improved contract. 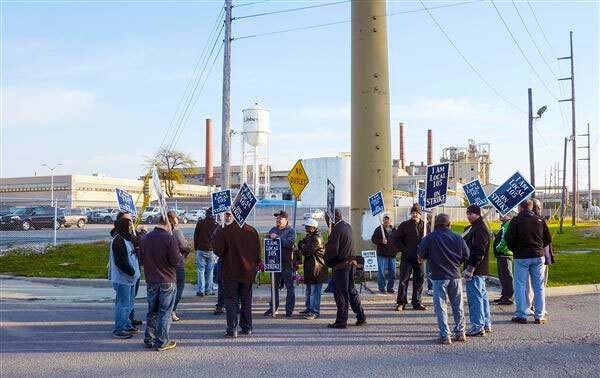 Nearly 115 IAM members at Libbey Glass in Toledo, OH, who went on strike after overwhelmingly rejecting a so-called “last, best and final offer” (LBFO) from the company, have voted to accept a new contract that holds the line on many membership concerns. The IAM Local 105 (District 54) members were joined on the picket lines by Glass Molders and Pottery Workers (GMP) Local 59 at midnight, October 12, when their contract extension expired. 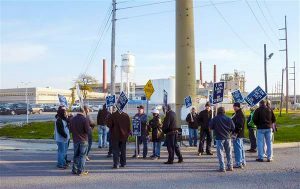 IAM members, however, didn’t return to the plant, instead honoring the picket line of GMP members, who rejected the revised offer from Libbey Glass. Sticking points in the dispute were working conditions, wage increases, mandatory overtime and a draconian attendance policy. IAM Negotiators remained at the bargaining table to negotiate with management at Libbey Glass, and brought the most recent offer that improved or removed the company proposals from the agreement to a ratification vote. Just as important, with an aging workforce, company-paid health care benefits will be reinstated retroactively to the date the work stoppage began. IAM members returned to work on their assigned shifts on Wednesday, October 26.